Constituted as 455th Bombardment Group (Heavy) on 14 May 1943. Activated on 1 Jun 1943. Trained with B-24's. Moved to Italy, arriving in Jan and Feb 1944. Served in combat with Fifteenth AF from Feb 1944 to Apr 1945. Engaged primarily in bombardment of strategic targets such as factories, marshalling yards, oil refineries, storage areas, harbors, and airdromes in Italy, France, Germany, Poland, Czechoslovakia, Hungary, Austria, and the Balkans. Received a DUC for a mission on 2 Apr 1944 when the group contributed to Fifteenth AF's campaign against enemy industry by attacking a ball-bearing plant at Steyr. Although meeting severe fighter opposition and losing several of its bombers on 26 Jun 1944, the group proceeded to attack an oil refinery at Moosbierbaum, receiving another DUC for this performance. 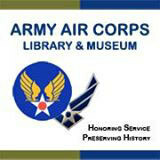 DVD Video with Combat Film footage of 304th Bomb Wing and the 455th Group in WW2. Inactivated in Italy on Sep 1945. Redesignated 455th Bombardment Group (Very Heavy). Allotted to the reserve. Activated in the US on 25 Mar 1947. Inactivated on 27 Jun 1949. Redesignated 455th Fighter-Day Group. Activated on 25 Jul 1956. Assigned to Tactical Air Command. Squadrons. 740th: 1943-1945; 1947-1949; 1956-. 741st: 1943-1945; 1947-1949; 1956-. 742d: 1943-1945; 1947-1949; 1956-. 743d: 1943-1945; 1947-1949. Stations. Alamogordo AAFld, NM, 1 Jun 1943; Kearns, Utah, c. 6 Sep 1943; Langley Field, Va, c. 5 Oct-2 Dec 1943; San Giovanni, Italy, 15 Jan 1944-9 Sep 1945. Hensley Field, Tex, 25 Mar 1947-27 Jun 1949. Myrtle Beach AFB, SC, 25 Jul 1956-. Commanders. Col Kenneth A Cool, c. Jul 1943; Col William L Snowden, c. 16 Sep 1944; Lt Col William R Boutz, May 1945; Maj Jerome Hoss, Jul 1945-unkn. Maj John C Smith, 25 Jul 1956-. Campaigns. Air Combat, EAME Theater; Air Offensive, Europe; Anzio; Rome-Arno; Normandy; Northern France; Scuthern France; North Apennines; Rhineland; Central Europe; Po Valley. Decorations. Distinguished Unit Citations: Steyr, Austria, 2 Apr 1944; Austria: 16 Jun 1944. In addition to strategic missions in the Balkans, the group bombed troop concentrations, bridges, marshalling yards, and airdromes during the fall of 1944 to hamper the enemy's withdrawal from the region. The group also supported ground forces at Anzio and Cassino in Mar 1944; knocked out gun positions in preparation for the invasion of Southern France in Aug 1944; and assisted the final Allied drive through Italy in Apr 1945 by hitting such targets as bridges, gun positions, and troop concentrations. Constituted as 455th Bombardment Group (Heavy) on 14 May 1943. Activated on 1 Jun 1943. Trained with B-24's. Moved to Italy, arriving in Jan and Feb 1944. Served in combat with Fifteenth AF from Feb 1944 to Apr 1945. Engaged primarily in bombardment of strategic targets such as factories, marshalling yards, oil refineries, storage areas, harbors, and airdromes in Italy, France, Germany, Poland, Czechoslovakia, Hungary, Austria, and the Balkans. Received a DUC for a mission on 2 Apr 1944 when the group contributed to Fifteenth AF's campaign against enemy industry by attacking a ball-bearing plant at Steyr. Although meeting severe fighter opposition and losing several of its bombers on 26 Jun 1944, the group proceeded to attack an oil refinery at Moosbierbaum, receiving another DUC for this performance. In addition to strategic missions in the Balkans, the group bombed troop concentrations, bridges, marshalling yards, and airdromes during the fall of 1944 to hamper the enemy's withdrawal from the region. The group also supported ground forces at Anzio and Cassino in Mar 1944; knocked out gun positions in preparation for the invasion of Southern France in Aug 1944; and assisted the final Allied drive through Italy in Apr 1945 by hitting such targets as bridges, gun positions, and troop concentrations. Inactivated in Italy on Sep 1945.